To participate in this year’s tournament as a Golfer, the registration is $250, sponsorship level opportunities range from $100-$5,000. All proceeds from the golf tournament benefit our philanthropic programs. 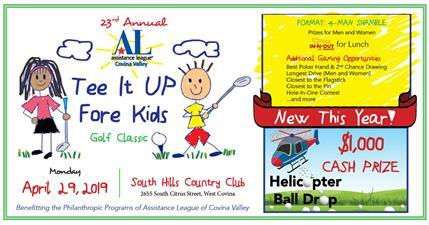 Assistance League of Covina Valley will host it’s 23rd Annual Tee It Up Fore Kids Golf Tournament on Monday, April 29, 2019 at South Hills Country Club in West Covina. This year we will honor Phil Vega, a lifelong resident of Glendora, having attended Glendora schools, Citrus College, and a graduate of University of La Verne. This is a fun day with many contests, IN-N-OUT lunch, Helicopter Ball Drop Cash Prize and Award dinner. Phil has been an ardent supporter of youth sports in our local community, having founded the Glendora chapter of Pop Warner Football, as well as coaching for many years.